This cashier sample job description can assist in your creating a job application that will attract job candidates who are qualified for the job. Feel free to revise this job description to meet your specific job duties and job requirements. 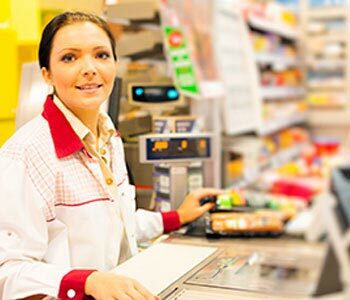 A cashier obtains payment for goods by scanning items, itemizing and totaling customer's purchases. Itemizes and totals purchases by recording prices, departments, taxable and nontaxable items; operating a cash register. Enters price changes by referring to price sheets and special sale bulletins. Discounts purchases by redeeming coupons. Collects payments by accepting cash, check, or charge payments from customers; making change for cash customers. Verifies credit acceptance by reviewing and recording driver's license number; operating credit card authorization system. Balances cash drawer by counting cash at beginning and end of work shift. Provides pricing information by answering questions. Maintains checkout operations by following policies and procedures; reporting needed changes. Job Seekers: Search Cashier Jobs and apply on Monster now.